Love, Mrs. Mommy is Hosting a Giveaway for 1 Lucky Winner to win a Younique Moodstruck 3D Fiber Lashes+! RV is $29. I need your help promoting! There are FREE & Paid Options Available. I look forward to working with you to promote this fun giveaway! Thank you for your help! 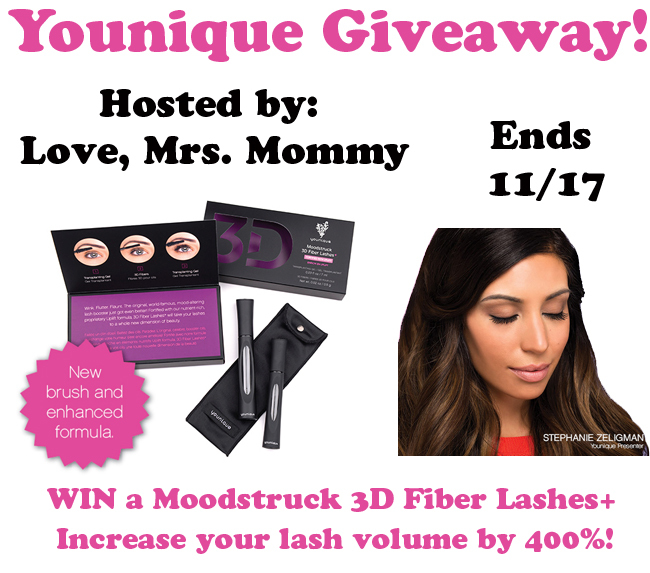 Younique Moodstruck 3D Fiber Lashes+! Co-Hosts Wanted & Needed ~ $5 for 5 links of your choice (Facebook Comments, Blog Comments, Giveaway Entries, Daily Votes, Social Media Follows of your choice, and Secret Word Pages, but NO GOOGLE+) PLUS the 2 FREE links above gives you 7 Links Total! Co-Hosts are not required to post announcement but it is greatly appreciated! The Blogger With The MOST Referrals will Receive a FREE Co-Host Spot on THIS Giveaway! Promote, Promote, Promote and Make Sure They Know To Say You Sent Them!